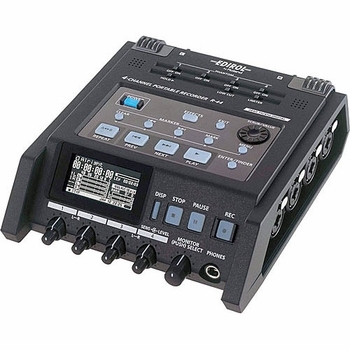 Roland/Edirol R-44 Compact 4-Channel Portable Recorder DJParts - All Variety of Parts that DJ Needs. The R-44 is a compact, four channel, solid-state field recorder that uses SD or large capacity SDHC cards as the storage media enabling quiet and reliable recording for a variety of professional audio needs. Capture up to 4 channels of uncompressed audio with selectable bit depths (16-bit or 24-bit) and sampling frequencies (44.1kHz/48kHz/88.2kHz/96kHz/192kHz). Onboard effects include limiter, low cut filter, 3-band EQ, 6-band GEQ, Enhancer, and DeEsser. Pro quality four channels recordings to large capacity SDHC cards. The Edirol R-44 is designed for professional use within a very conveniently sized package. Capture up to 4 channels of uncompressed audio with selectable bit depths (16-bit or 24-bit) and sampling frequencies(44.1kHz/48kHz/88.2kHz/96kHz). R-44 employs SD cards or large capacity SDHC cards as the recording media. No moving parts enables the most silent and reliable operation possible. Built-in stereo microphones and monitor speakers Although the R-44 is compact, all the necessary functions are included. Built-in high quality microphones and speakers make recording and monitoring without external devices possible.